Hey guys! The weekend is here! Time to sit back, relax, and do a little Photoshopping. 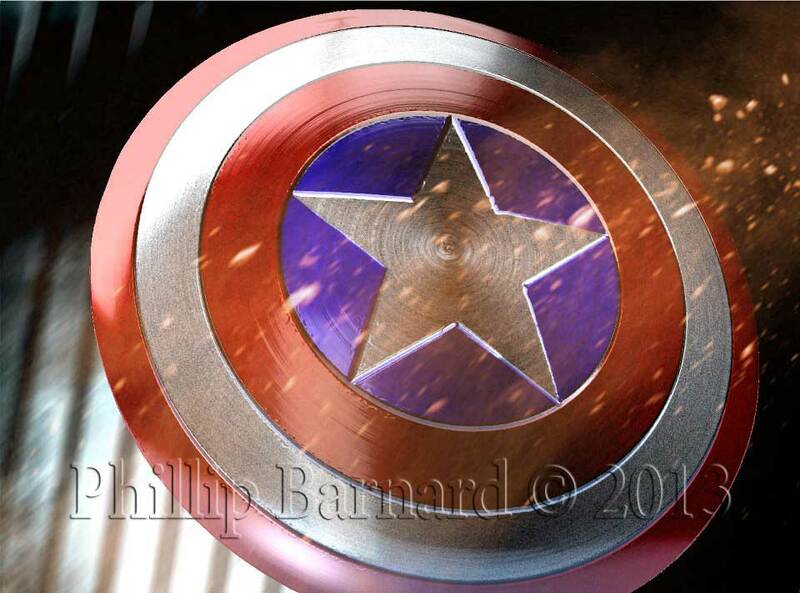 Phillip tells me that this is his very first week using Photoshop. I think I speak for everyone when I say great job, Phillip! Keep up the good work! If you'd like to follow Phillip's progress as he hones his skills, you can click the links above to visit his Facebook page. If you prefer Twitter, you can find him @BLITZheartthrob . Thanks, again, for the submission, Phillip. Job well done. If you've completed one of our tutorials and would like to share the results, we'd love to see them! You can send them to us through email or on our Facebook page. We look forward to seeing them. Are you in the West Plains, MO area? Do you like or have ever been interested in Dungeons & Dragons? Do you like doing charitable things for children trapped in a boring hospital room? Well have I got good news for you. 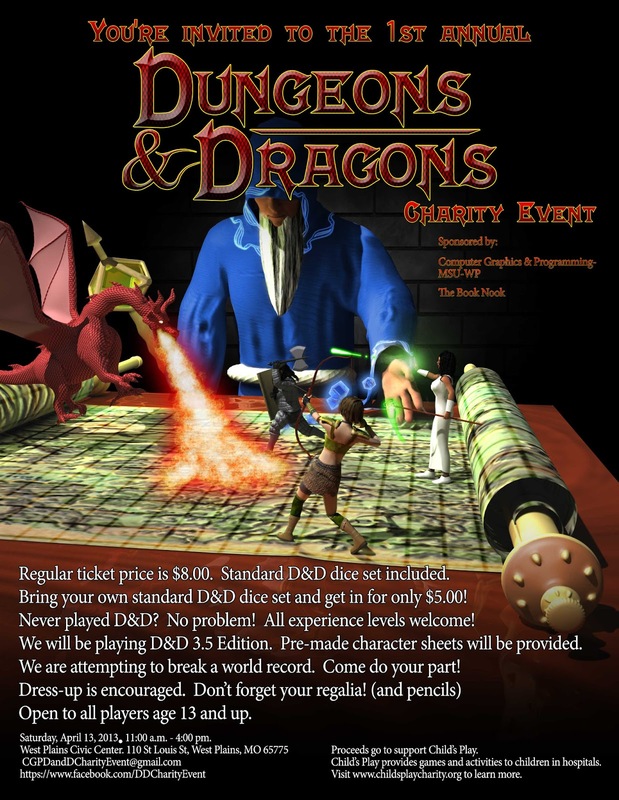 The Computer Graphics and Programming department of Missouri State University - West Plains, along with The Book Nook of West Plains, is sponsoring a charity D&D event. Proceeds from ticket sales will go to benefit Child's Play. Child's Play provides games and activities to children in hospitals around the world. Thanks to their efforts, a sick child's stay in the hospital can be a little less miserable and scary. Regular ticket prices are only $8.00 and a new set of standard D&D dice are included with your purchase. If you have your own standard D&D dice, good news! You get in for only $5.00! For more information, visit their Facebook page at http://www.facebook.com/DDCharityEvent Be sure to pre-register while you're there. And one last thing: we're trying to break a world record for the most participants in a single D&D match, so yea, one more reason to come out. You could be part of the moment! It's open to the public age 13 and up, it'll be a ton of fun, and it's all for a good cause! If you're in the area or can be on Saturday April, 13th, please stop by the West Plains Civic Center and show your support. For your viewing pleasure, here's the flyer. And just to keep this post content-sensitive, the flyer was made by me, (mostly) in Photoshop. If you have questions, you can leave them in the comments section, or send me a direct message. Or, you can ask them via the Facebook page.